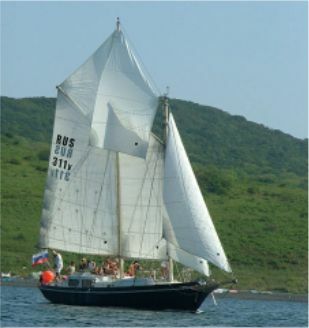 This boat was originally drawn as a smaller sister to my HOUT BAY 50 gaff schooner. She is now also available with gaff cutter and marconi cutter rigs. 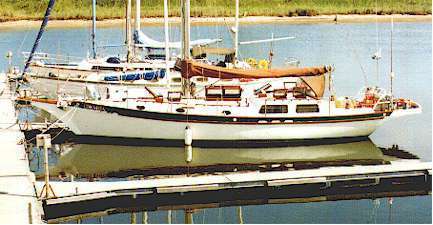 She has the above water characteristics of a traditional yacht combined with a modern underbody with long fin keel and skeg mounted rudder. Handling characteristics are good with this combination and even with the gaff rigs she will comfortably beat off a lee shore. Hull construction is multi-chine steel with radiused topside chine, having a round bilge appearance above the water. She can also be built as a conventional multi-chine. Hout Bay 40 "Coralita". Note that her bumkin is non-standard. The gaff rigs use gaff jaws and parrels. Lower masts are sealed steel tubes while all other spars are spruce or oregon pine. Standing rigging is galvanised, with all rope running rigging. All blocks are wood shelled and the only winches needed are for sheeting of the larger headsails. The result is a rig which can be almost completely built by the amateur builder. Imported hardware needed is minimal, with considerable cost benefit. 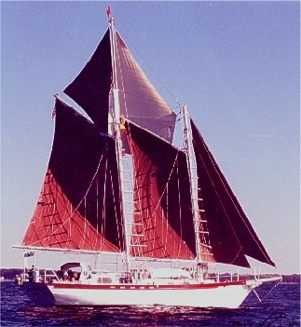 The single topmast schooner rig is of moderate proportions to make it simple and easy to handle but is short on sail for light conditions. For those wanting light air performance and accepting the increased complication, a fore topmast can be added. The cutter rig has sufficient power for all conditions. The schooner rig will be at it's best when reaching while the cutter rig will be better on the wind and running dead before. 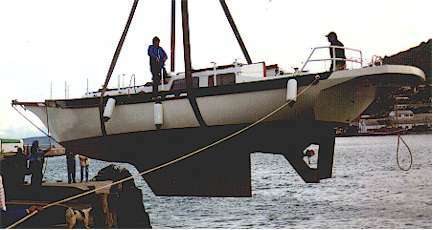 The marconi cutter rig uses aluminium spars and is powerful, requiring considerably more winch power than the gaff rigs. This is the best rig for windward work. The large beam and fullish ends give a large volume and permit a very comfortable layout. Three layouts have been designed with an alternative saloon area on one in addition, giving a wide range of possibilities. The engine is just aft of the schooner mainmast position, with the accommodation worked around it. This gives good all-round engine access, the engine being under the galley worktops. The propeller is in an aperture in the skeg, immediately forward of the rudder. A shoal draft wing keel option is available to those who intend to cruise shallow water areas such as the European canal systems. The draft of 1,3m, with substantial ballasted wings to maintain stability and reduce keel crossflow, will give sailing characteristics close to those of the deep keel version. The HOUT BAY 40 is designed to take her crew anywhere that they wish to go on the oceans of the world. This she will do in comfort and safety. For a larger design in this concept, see the Hout Bay 50. Follow these links to print or download a material list for the structure, a stability curve or the list of drawings for this design.